Advancements in technology not only provide us with new computational possibilities but also create more efficient ways of information sharing and knowledge construction. 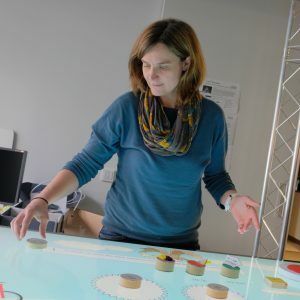 In my research, I am interested in tangible user interfaces as novel form of interaction, that allows to create new ways of collaborating and socially interacting in an IT-enhanced environment. Currently, I am a researcher at the LIST – Luxembourg Institute of Science and Technology (formely Public Research Center Henri Tudor) in Luxembourg. I am studying tangible tabletops in the context of collaborative problem solving and collaborative decision making. From 2006 to 2010, I was a doctoral candidate at the Vienna University of Technology, Institute for Design and Assessment of Technology, and a project assistant within EU funded integrated project IPCity. I was working on the ColorTable and the MR-Tent as tool for collaborative and participatory urban planning. My background is Computer Science with a focus on Media Computing, Computer Graphics and Digital Image Processing, which I studied from 2001 to 2006 at Vienna University of Technology. I am always interested in new opportunities for collaboration. If you have an idea, feel free to contact me.